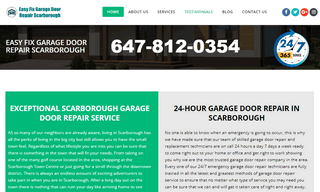 Easy Fix Garage Door Repair is a leading garage door company for installation and repair in Scarborough and surrounding areas. Using the latest technology, styles and trends and our relentless pursuit for customer satisfaction as our driving force, we offer full installation and repair services across Scarborough. Our garage door repair technicians team maintain their strict professionalism through continued industry education. No one plans to have their garage door malfunction. So, to help ease the stress of having your garage door repaired or replaced, we’ll work hard to get the job done as fast as possible while still providing expert-level service. Each of our trucks is equipped with the high-quality parts and tools needed to fix your garage door system, plus our emergency garage door repair service ensures that you get the repairs you need right when you need them.